As each utility, municipality, and asset owner organization begins to put together policies for small cell attachments, people also expect that the Federal Communications Commission will step in to set nationwide rules for small cell deployment. While the FCC doesn’t regulate pole attachments in every single state, it is likely that municipal utilities, cooperatives, state-managed utilities and others will follow the FCC’s lead when regulations are established. In the meantime, small cell deployments will continue to gather speed and will advance in a patchwork manner across the U.S. Existing federal, environmental, and historic regulatory processes were designed for the era of macro towers. Currently, cell sites of any size are classified as federal undertakings, subject to federal regulation; they operate on a spectrum licensed by the government. This requires carriers to comply with historic preservation and environmental regulations. However, small cell coverage areas are significantly smaller than macrocells that serve several square miles. 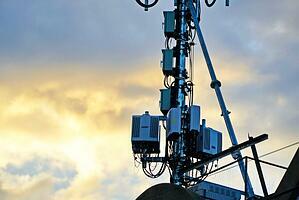 Carriers will likely deploy ten to 100 times more small cell attachments than macrocells. The FCC’s existing guidelines worked for deploying 3G and 4G technologies, but as we continue to move closer to 5G, small cell deployments are hindered by the current attachment permitting requirements and cost structures of older technologies. FCC commissioner Brendan Carr is leading the charge to revise permitting processes and fee structures for small cell deployment in the U.S.
FCC Commissioner Carr has stated that the biggest issue for the wireless industry today - related to small cell deployments - is fees. Carr hopes to update existing regulations and thereby reduce the regulatory costs of deployment by 80 percent and cut deployment timelines by more than half. By cutting costs and reducing deployment timelines, the FCC hopes to speed up Americans’ access to 5G coverage. Current estimates say that the anticipated reforms will likely spur several thousand additional small cell installations across the U.S. within the next 12 months. The proposed reforms include guidelines that "siting, mounting, placement, construction, modification and operation of small wireless facilities is a permitted use by right" when it comes to public right-of-way. To date, nineteen states have enacted legislation on small cell deployments: Arizona, Colorado, Delaware, Florida, Illinois, Indiana, Iowa, Kansas, Minnesota, North Carolina, New Mexico, Ohio, Oklahoma, Rhode Island, Tennessee, Texas, Utah, Virginia, and Washington. Additional states are currently considering their own small cell laws, while at the same time, the FCC’s Broadband Deployment Advisory Committee is developing a State Model Code for Accelerating Broadband Infrastructure Deployment and Investment. While no one can know exactly how small cell deployments and related regulations will continue to progress, we should expect that over the next decade small cell attachments will become ubiquitous throughout the industries involved in joint use. It may take some time to catch up to new technology and guidelines, but it’s coming whether we’re ready or not. It’s time to start getting ready.